Richard Vandersteen, founder and chief designer of Vandersteen Audio, has been making highly regarded loudspeakers in his purpose-built factory in California for over 35 years now. Every Vandersteen model is designed to be accurate and true to the original music, and uses unique designs in both cabinets and drive units to achieve this result. Whether you’re looking for a top end high performance system that includes the wonderful 5A Carbons, or something on the more affordable side of the price spectrum like the high value Treo, we suspect you’ll find a Vandersteen model that can be the perfect performance solution for your needs and system. Please call us to discuss your application or set up an audition! 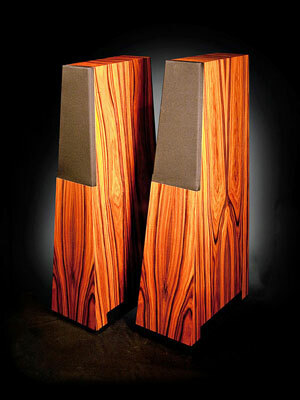 For additional information, you can also visit the Vandersteen Audio website. 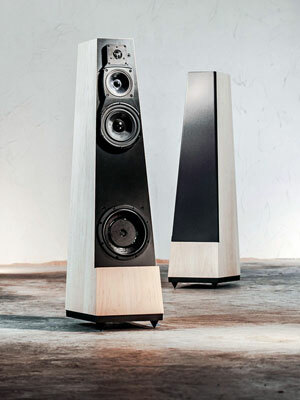 Vandersteen Audio’s Model 5A Carbon is the latest evolution of the classic Model 5 and little brother to the flagship Model 7. 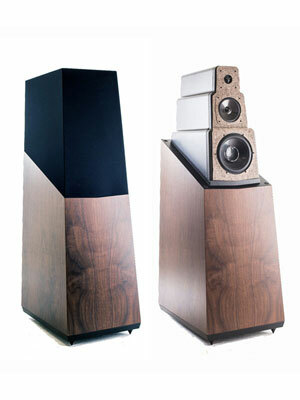 The Models 5 and 5A reigned at the top of the Vandersteen line for over a decade, exemplifying many of Richard Vandersteen’s highly effective design principles. The 5 Series have always been time and phase correct speakers, with extreme-performance features that include an ultra-rigid, constrained-layer head section with Minimum-Baffle construction, a 400-watt powered-bass section with 11-band room EQ, passive high-pass filters and a highly advanced, completely proprietary 12″ push-pull subwoofer driver. What separates the 5A Carbon from previous iterations of the 5 Series are its carbon-fiber midrange and tweeter drivers, descended directly from the patented Perfect-Piston drivers developed for the flagship Model 7. These carbon drivers are the result of an unprecedented 10-year research & development effort at Vandersteen. The Model 5A Carbon is a paragon of high-frequency air and extension, midrange openness and resolution, and has the kind of tight, tuneful deep bass that only a powered-bass speaker with integral room EQ can provide. The Vandersteen 5A Carbons pair beautifully with our Audio Research electronics, and will also be very happy matched with any quality preamp / power amp combination. From $31,000 a pair, with many finish and grill color options available. The Quatro Wood CT is the latest evolution in Vandersteen speaker technology, derived from the award-winning Model 5A Carbon. Featuring the Carbon Tweeter created for its big brother, the Quatro Wood CT has an astonishing amount of air, space, and natural purity that only carbon driver cones can offer. Like all Vandersteen speakers, the Quatro Wood CT is a time and phase correct loudspeaker made in the USA, utilizing and creating parts that are typically found only in cost-no-object designs. In addition to its Carbon Tweeter, the Quatro Wood CT features Vandersteen’s patented Reflection-Free 4.5″ midrange driver, a 6.5″ Tri-Woven woofer for superior transient response and definition in the crucial lower-midrange/midbass frequencies, as well as a powered subwoofer section. Each custom-built amplifier powers dual 8″ drivers that work in conjunction with passive first-order high-pass filters and an 11-band EQ for expanded room optimization. This gives us unprecedented control over the placement of speakers in the listening room. All of this technology allows the Quatro Wood CT to offer the kind of exceptional resolution, imaging and natural musicality Vandersteens are known for, with deep and powerful yet tuneful bass, and gives us considerable placement freedom in your listening space. From $14,600, with many finish and grill color options available. The Treo CT is essentially a passive version of the Quatro CT, sharing a similar driver complement minus the powered bass system. It’s an extremely cost-effective performer finished in an attractive, elegant package and remarkably is still hand made in the USA. The Treo is a time- and phase-correct full-range loudspeaker. The proprietary transmission-line loaded tweeter and Vandersteen’s Reflection-Free 4.5″ midrange driver break up energy from behind these drivers before they can pass directly back into the room and to the listener’s ears. The 6.5″ Tri-Woven woofer offers superior transient response and definition in the crucial lower-midrange and midbass frequencies, with the bass foundation supplied by the ported, carbon-loaded 8″ woofer with an ultra-long motor assembly. The crossovers are ultra high-performance designs featuring extreme-quality parts, and individually tuned in an anechoic chamber. Vandersteen’s Minimum Baffle enclosures ensure maximum rigidity, free of time-smearing reflections and diffraction. All of this technology allows the Treos to offer the kind of exceptional resolution, imaging and natural musicality that have made Vandersteens famous. The Vandersteen Treos are an easy load and can partner well with most any quality power amp or integrated amp, including the Audio Research, Rega, and Linn models here in the store. Treos start at $8400, and have a range of attractive finish options.